The Mandelbrot set shows more intricate detail the closer one looks or magnifies the image, usually called “zooming in”. The following example of an image sequence zooming to a selected c value gives an impression of the infinite richness of different geometrical structures, and explains some of their typical rules. The magnification of the last image relative to the first one is about 10,000,000,000 to 1. Relating to an ordinary monitor, it represents a section of a Mandelbrot set with a diameter of 4 million kilometres. Its border would show an astronomical number of different fractal structures. Start. Mandelbrot set with continuously coloured environment. The seahorse “body” is composed by 25 “spokes” consisting of two groups of 12 “spokes” each and one “spoke” connecting to the main cardioid. These two groups can be attributed by some kind of metamorphosis to the two “fingers” of the “upper hand” of the Mandelbrot set; therefore, the number of “spokes” increases from one “seahorse” to the next by 2; the “hub” is a so-called Misiurewicz point. Between the “upper part of the body” and the “tail” a distorted small copy of the Mandelbrot set called satellite may be recognized. The central endpoint of the “seahorse tail” is also a Misiurewicz point. Part of the “tail” — there is only one path consisting of the thin structures that lead through the whole “tail”. 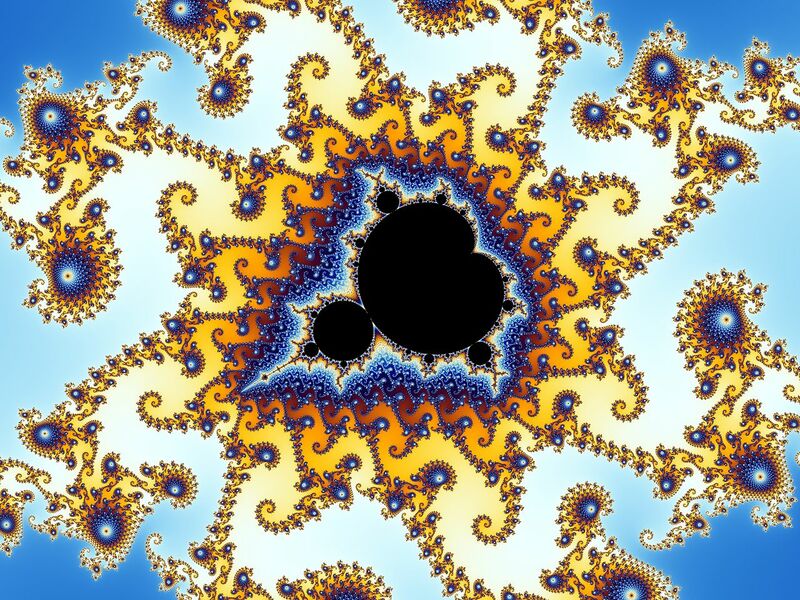 This zigzag path passes the “hubs” of the large objects with 25 “spokes” at the inner and outer border of the “tail”; thus the Mandelbrot set is asimply connected set, which means there are no islands and no loop roads around a hole. Satellite. The two “seahorse tails” are the beginning of a series of concentric crowns with the satellite in the center.Open this location in an interactive viewer. Each of these crowns consists of similar “seahorse tails”; their number increases with powers of 2, a typical phenomenon in the environment of satellites. The unique path to the spiral center passes the satellite from the groove of the cardioid to the top of the “antenna” on the “head”. “Antenna” of the satellite. Several satellites of second order may be recognized. The “seahorse valley” of the satellite. All the structures from the start of the zoom reappear. Double-spirals and “seahorses” – unlike the 2nd image from the start they have appendices consisting of structures like “seahorse tails”; this demonstrates the typical linking of n+1 different structures in the environment of satellites of the order n, here for the simplest case n=1. Double-spirals with satellites of second order – analog to the “seahorses” the double-spirals may be interpreted as a metamorphosis of the “antenna”. In the outer part of the appendices islands of structures may be recognized; they have a shape like Julia sets Jc; the largest of them may be found in the center of the “double-hook” on the right side. The islands above seem to consist of infinitely many parts like Cantor sets, as is[clarification needed] actually the case for the corresponding Julia set Jc. However they are connected by tiny structures so that the whole represents a simply connected set. The tiny structures meet each other at a satellite in the center that is too small to be recognized at this magnification. The value of c for the corresponding Jc is not that of the image center but, relative to the main body of the Mandelbrot set, has the same position as the center of this image relative to the satellite shown in the 6th zoom step.